Electric Hopscotch. Photo by Stuart Wainstock. Electric Hopscotch: a glowing electronic twist on the classic jump and skip game. In Electric Hopscotch, the interaction between players is a physical dance of memory, ranging from simple steps to complicated jumps. Electric Hopscotch will be mobile; instead of chalked squares on the pavement, players position “jump-pads” in any order or direction they prefer. The jump-pads contain electronic memory sensors, outlined with glowing surface-mounted LEDs. They come in four shapes: triangle one-foot pads, square two-feet pads, long pill-shaped spacer pads, and circle start and finish pads. To play, a person completes a sequence of jumps and skips on the pads from start to finish. The pads remember the sequence of jumps and play back the order by lighting up in sequence. Player 2 then has to jump in the same order as Player 1. If there is a misstep, the jump-pads blink red, and Player 2 gives up a turn. For more variety, or for new players, the jump-pads can be reset to take on a new jump sequence. 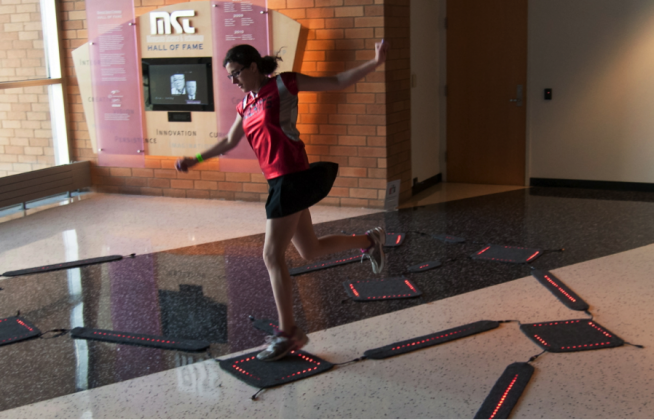 An unlimited number of players can participate in Electric Hopscotch, just not all at once. One player at a time—and then whoever wants to accept the challenge can try to replicate your rad jump and skip moves!